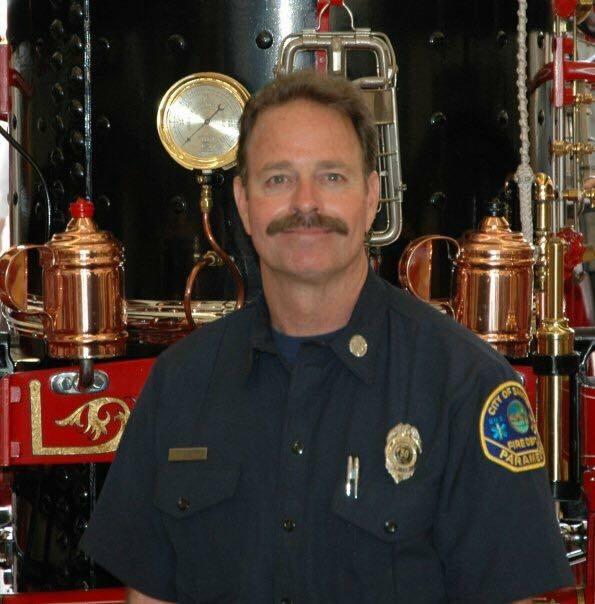 We are deeply saddened to announce the passing of Retired Santee Fire Captain Rick Williams. For those of you who did not know or work with Rick, I can assure you that he would have enriched your life with his friendship. He was hired on July 7, 1985 as a Firefighter and his job specification changed in October of that same year to Firefighter/Paramedic. Rick loved being a paramedic and was very skilled in paramedicine. He was appointed to Interim Fire Captain on May 19, 1997 and placed in the permanent spot a month later on June 12. Rick was heavily involved in moving our department forward and played a key role in our partnership with the Burn Institute and the Smoke Detector Program. He was also a member of our Color Guard, but I think that he gained the most notoriety, and was a superb fit, in his role as Fireman Gus in the LAFS Program (Life and Fire Safety). He served the community in that role for close to a decade and was certainly a presence during the shows.Rick saw the importance of maximizing his health and retired after 26 years of service to this community on August 5, 2011. His true character showed throughout his battle, as he was always positive and appreciative of his time with family and the friendships that he fostered in Santee. Rick was a great friend, solid Fire Captain and Paramedic, and was the guy who would make you a better person by hanging around him. We lost a good one…He will be deeply missed.